TL;DR: Israeli police obtained a subpoena, based on intentionally false information, with the judge’s knowledge, for the identity of a WordPress.com blog owner, which was, in fact, the police itself, to uncover how Automattic, WordPress.com’s owner, handles such orders, and whether it informs bloggers of subpoenas relating to them. In early 2017, Israeli police arrested six suspects in what has been named the Web Terror Affair, suspected among other things of running a network of blogs, some of them on WordPress.com, defaming judges, social workers, prosecutors, cops and physicians, for their alleged part in removing children from their parents’ custody. Court documents relating to one of the suspects, Lori Shem-Tov, revealed that before contacting Automattic for the suspects’ identities and information, police wanted to make sure such a request wouldn’t prematurely reveal their investigation to the suspects. So they plotted a scheme: They would set up a blog on WordPress.com, then subpoena the fake blogger’s identity claiming he’d violating Israeli law, and wait to see if Automattic notified the fake blogger about the subpoena. To do that, the police would have to either actually break the law on the blog, lie to a judge, or convince a judge to play along and knowingly issue a subpoena based on false information. They went with the latter, probably assuming it’s safer to have a judge on their side. Their request, submitted by Advanced Staff Sergeant Major Elli Lurie, said (in Hebrew) that “Since it’s a delicate subject and a work interface with WORDPRESS.COM hasn’t been established yet, we don’t have an indication whether our requests to them reach the woman who runs the requested sites. To check this we opened a site on WORDPRESS.COM called machzor1986.wordpress.com. We’re asking for a subpoena for this site for the aforementioned indication”. Ironically, it was important for Lurie to make it clear that the police wasn’t breaking the law – the privacy law, anyway: “We hereby declare that this site is under our control meaning that receiving information about it doesn’t constitute any kind of privacy invasion”. The next day, Sergeant Major Hanny Giladi appeared before Tel Aviv Magistrate’s Judge Ronit Poznanski-Katz, declaring under oath that the petition was true. 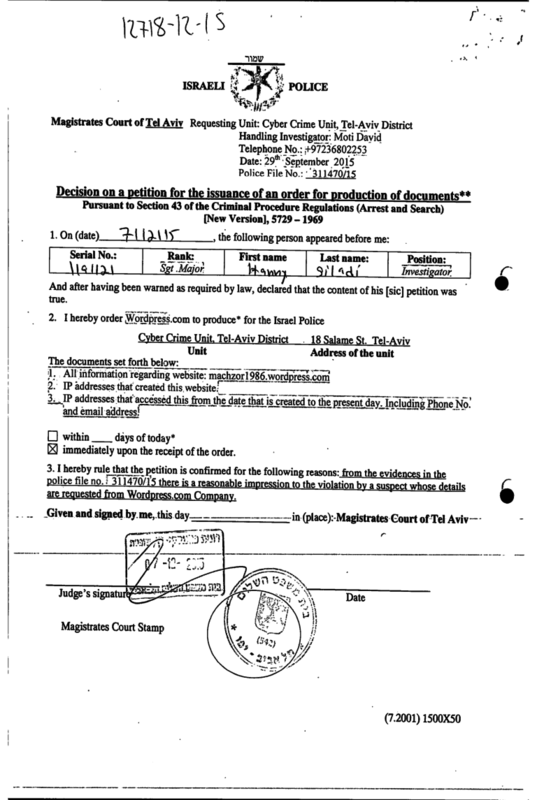 Judge Poznanski-Katz issued the subpoena, in English, requiring “Wordpress.com” (and not Automattic, the company that runs it), to produce for Israel Police “All information regarding website: machzor1986.wordpress.com[;] IP addresses that created this website[;] IP addresses that accessed this from the date that is created to the present day. Including Phone No. and email address […] immediately upon the receipt of the order” (all mistakes sic). A complaint, filed with Chief Justice Esther Hayut three years later by the Association for Civil Rights in Israel (ACRI), originated in a complaint filed by suspect Shem-Tov against Judge Poznanski-Katz, when the latter successfully petitioned the High Court of Justice to reverse her dismissal following another embroilment. The Israel courts spokeswoman told Haaretz: “ACRI’s letter was received at the Chief Justice’s office on December 30th, 2018. The subpoena mentioned in the Association’s appeal is from 2015. ACRI emphasized in its letter that ‘this letter isn’t about a complaint against the judge, but about the arising need to examine whether it was an isolated incident or rather a wider phenomena’. The issue is currently being examined, and the appropriate measures will be determined according to the findings”. Israel Police has not responded to a request for comment.